It was in Scotland many years ago that our long term love affair with all things gastronomic began. On a short trip to Kircudbright, at an unassuming little restaurant whose name we have never remembered, we experienced a gastronomic Road to Damascus and like heroine addicts experiencing our first high, we spent the rest of that trip in pursuit of further gourmet revelations. We’ve continued on that mission ever since. But while the bonnie land north of the border promised an edible Eden long-remembered, remarkably it had never made it onto our hiking retinas. Before relocating to the Canary Islands fifteen years ago, our camping and walking weekends had taken us from Lands End to the Lake District but no further. 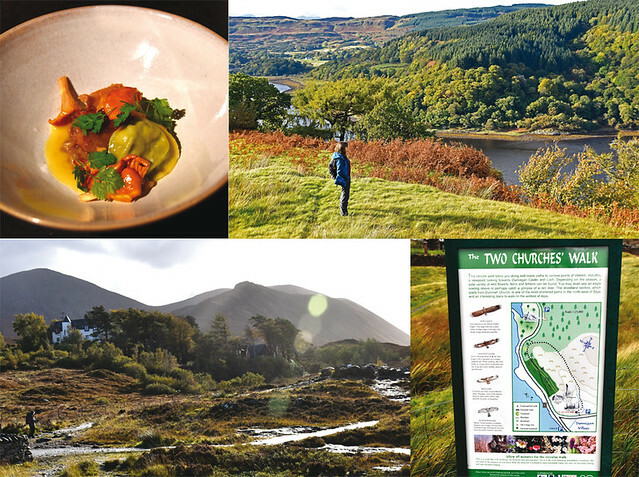 With the food expectations bar set at a romantically reminiscent high, and walking expectations right up there with it, it was fitting that some thirty years after first awakening our taste buds, Scotland should receive pride of place as our first UK gastro-hiking destination. In early September, with ten days ahead of us, we set off to explore the epicurean and walking delights of a slice of Scotland, from Dumfries & Galloway to the Isle of Skye. It had been a long, hot summer in Portugal, most of it spent in the curtained and cool interior of our office, save for a trip to the glorious Drôme Provençale where we walked in temperatures of 30+ degrees, longing for the cool onset of autumn. Arriving at Glasgow airport, our wishes were fulfilled as the UK’s record-breaking summer retreated, and September arrived with an unseasonal chill in the air. Driving south to Dumfries & Galloway, an undulating canvas of velvet green meadows unfolded, grazed by long-haired cattle and barrell-shaped sheep. Clumps of proud Scots pines stood tall like troops on a green baize battle field, maintaining their perfect formation against the prevailing breeze while on the skyline, the sails of wind turbines carved circles in the sky. Stepping out from our hotel door or driving out to quaint villages, we followed trails that climbed grassy meadows, skirted farms and crossed rickety styles in fields whose views constantly stopped us in our tracks as our eyes scanned the uncluttered, unspoiled expanse of nature that surrounded us. On quiet country lanes bordering meandering streams, through dark woods of oak and chestnut, and along an old Roman road we walked, barely encountering another soul along the way save for the occasional dog walker. Our paths took us to an old Covenanters graveyard where we strolled between ancient headstones carved with inscriptions whose opening sentences have long ago fallen into the ground on crumbling stones. The further north our journey took us, the more dramatic the scenery became, soft rolling meadows gradually giving way to deep, twisting glens and silent lochs enfolded in brooding hills as the splendour of the Highlands engulfed us. Water became a constant companion to our walks, either stretching into the distance in deep lochs alongside the path or falling from the sky in near-horizontal force, soaking us through to our underwear. From Crianlarich we followed a section of the West Highland Way, in weather so atrocious ducks would think twice before venturing out, yet here we met more fellow hikers than we had seen for our entire trip and every one of them had smiles the size of the Forth Bridge, clearly loving the double challenge of the trail and the weather. The unrelenting rain followed us all the way to the Isle of Skye where the landscape opened out into straw-coloured moorland beneath a vast sky of gathering clouds. Here our walks took us over rugged headlands and along sandy beaches of delicate pink coral, the wind threatening to carry us off like boot-clad kites. 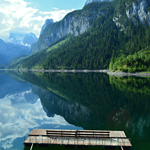 As diverse as it is stunning, the hiking in Scotland is an enthralling cornucopia of landscapes, whether you’re bagging Munros, strolling the banks of lochs or heading out on one of the many long distance paths that criss-cross the countryside. And don’t be put off by the prospect of cold, wind or rain, we encountered all three and it only served to strengthen the hiking kindred spirit. This may have been our first foray into Scotland’s hiking delights but it certainly won’t be our last. 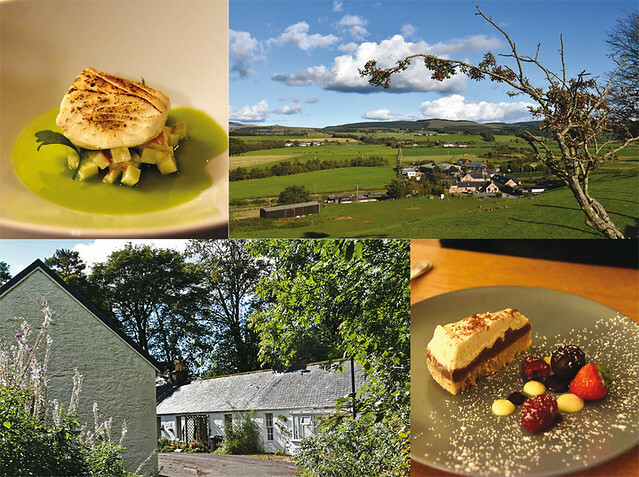 Whilst Scotland may not have many Michelin Star awarded restaurants (four in the 2018 guide), the standard of gastronomy we encountered right across our travels was extremely high and in places, exceptional. 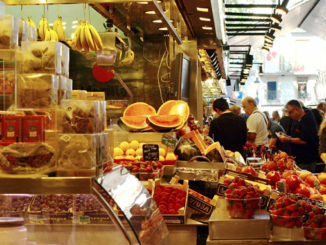 The emphasis on using fresh, local produce and of incorporating innovative techniques and contemporary presentation to traditional recipes was a theme we found reflected across a wide range of hotels and restaurants rather than just in a handful of places in which few locals could afford to dine. 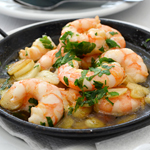 Like everywhere with a strong culinary tradition, some dishes could be found on almost every menu – haggis, venison, cullen skink, fish & chips and interestingly, Eggs Benedict – and in almost every case prepared and presented with a local twist but always delectably tasty. The stand-out classic dishes we encountered were the fish & chips and the haggis-stuffed chicken breast at Harry Haw’s on Bute; the cullen skink and the Eggs Benedict at Hame hotel on Skye; a creamy and spicy pumpkin soup at Lochside Tea Room in Dunvegan on Skye; black pudding mash at Four Seasons hotel in St Fillan; a steak and haggis pie at the Cuan Mor bar-restaurant in Oban; and the steak pie and the tablet ice cream at Best Western Crainlarich. The availability of superb produce is one of the things that made our Scottish foodie travels so tasty and there are some dishes that will join our Kircudbright hall of gastronomic fame, lingering in my memory for as long as it takes to get back there and try them again. Amongst the ingredient highlights of our trip were venison parfait at the Trigony House Hotel; beef tartare with beetroot sorbet and jelly, and roast partridge breasts at Blackaddie; smoked salmon at Knipoch; and wild mushroom soup with garlic and rosemary at Achray House hotel – all products sourced from the doorstep and lovingly transformed into stand-out dishes. I have no doubt more Scottish restaurants will choose to go down the Michelin star route, but I love the fact that Scotland is offering high quality dining to a large section of the population rather than concentrating on top notch gastronomy for the few. Long may it continue. We’ve chosen to include reference here to the superb hotels we stayed in during our trip, simply because that’s where we enjoyed most of our dining. Almost all of the hotels we stayed in during our trip were small, family-owned boutique hotels and all of them provided excellent service combined with good food and a high level of comfort. The icing on the cake for us was locations close to good walking routes, either from the door or in easy driving distance. We’ll be covering each hotel in more detail on these pages so this is just a summary of what made our stays in each so memorable. Trigony House hotel, Thornhill – a dog-friendly, warm and welcoming gastronomic gem of a hotel with soft leather sofas, roaring log fires, and a cosy, country pub-style atmosphere. Their Barbary duck and their venison parfait were both sensational, as was their full Scottish breakfast. The sort of place you really hated the thought of checking out from. 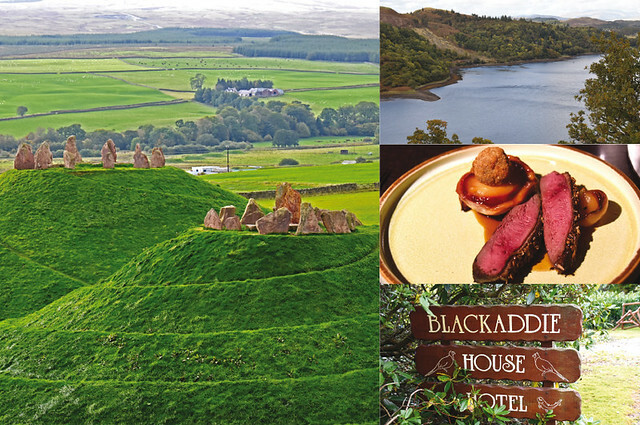 Blackaddie, Sanquar – “a restaurant with rooms” as award-winning chef-owner Ian McAndrew describes the Scottish hunting lodge-style hotel he runs with his wife Jan on the outskirts of Sanquar. 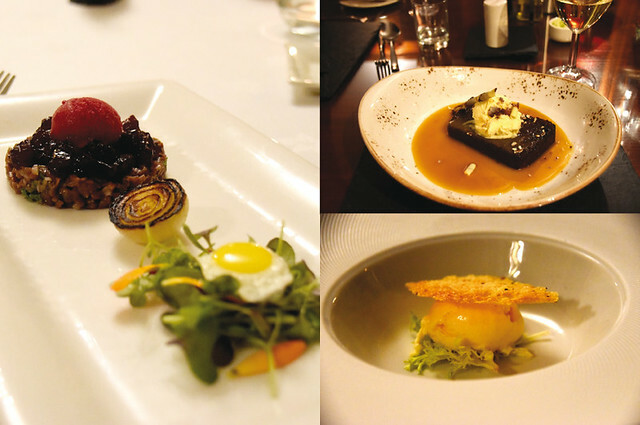 The food here is the unrivalled star of the show with Michelin standard dining featuring all fresh, local produce. Incidentally, their peat-smoked haddock at breakfast is worth walking barefoot through snow to enjoy. Best Western Crianlarich – although bucking the ’boutique’ theme, this hotel is perfectly positioned for access to the West Highland Way and offers a warm and cosy welcome, a good restaurant and an effective drying room, all essentials in the walkers’ handbook. As a bonus, their steak pie is delicious, as are their Eggs Benedict. Knipoch, Oban – more like a stately home, this superb family-owned hotel, spectacularly located overlooking Loch Feochan has scenic walks straight from the door, well the woods behind to be accurate, and the best smoked salmon I have ever tasted, marinated in herbs and then smoked over oak for three days. Probably the most professionally run hotel we stayed at, it exudes a quiet, sophisticated elegance. Hame hotel, Isle of Skye – it’s hard to imagine a warmer welcome than the one you’ll get at this delightful, family-run hotel set in the bay at Roag. The décor is a fresh take on Ikea and makes a nice change from the more sombre, hunting lodge style favoured by many. Superb Eggs Benedict for breakfast, and a tasty set menu featuring meat-free choices compliment the most welcoming hotel bar on our trip, run by the incomparable Tom. We could happily have stayed much longer. 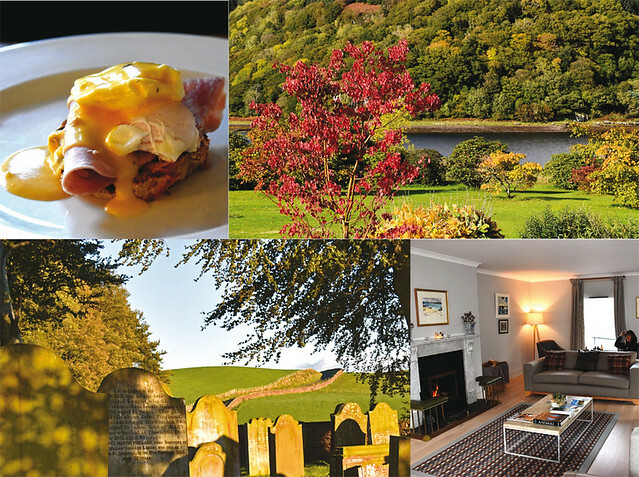 Achray House, St Fillans – a late 19th century stately home overlooking the beautiful Loch Earn, this guesthouse-style hotel offers a comprehensive collection of wines, whiskies and gins. It also has superb service, lovely bedrooms with oodles of floor space, and excellent food including a delectable fish pie and the best date & Pecan nut pudding I’ve ever eaten. Four Seasons, St Fillans – set just along the road from Achray, and not to be confused with the Four Seasons group, this dog-friendly hotel has great views over the Loch from its front bedrooms and runs a popular restaurant which, on the night we stayed, featured roast belly of pork with black pudding mash, an accompaniment which I feel is bound for our dining table. We expected a great deal from our short visit to Scotland, and it delivered in spades. The food was consistently excellent and we did not have a single bad eating experience, far from it. The walking was hugely varied and a constant joy. Paths were usually well signposted and invariably featured lots to keep interest levels high, from Roman fortlet to an old POW camp, not to mention the ever-changing, always stunning landscape. Routes could be easy-peasy or testing, depending on how much time and energy we wanted to expend and there were no issues with access to public paths. What was perhaps most surprising for us was the very high standard of accommodation we enjoyed. Each hotel had its own personality and the food ranged from good to outstanding but they all delivered top notch service and a wide-armed welcome. 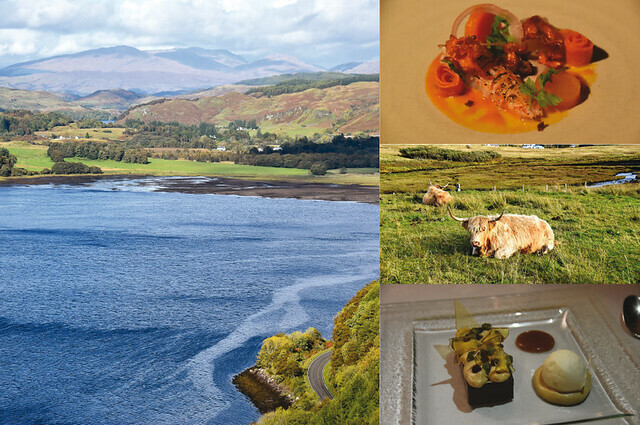 Scotland’s Hotels of Distinction and Scotland’s Personal Hotels invited Buzz Trips to experience the hospitality and gastronomy of their hotels in order to showcase the delights of a stay in Scotland. 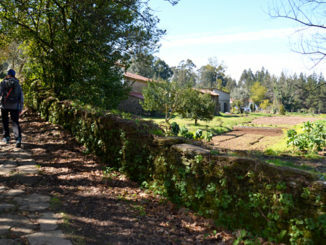 Together we devised an itinerary that would allow us to take in some delightful walking as well as sampling a small selection of their superb hotels.